Sandjacking™ is the process of leveling concrete with dry limestone sand. We raise the sections of concrete to the correct level and fill the area underneath with dried limestone sand to fill the entire void. Polyurethane foam lifting uses polyurethane foam to raise concrete and fill voids underneath concrete. The foam even clings to the bottom of the concrete for better structural integrity and insulation value. Mudjacking is an outdated way to level concrete. It’s not as effective in the long-term as Sandjacking or Polyurethane foam, so we don’t offer it. Mudjacking involves pressure point lifting which creates triangles or pads beneath the concrete, but it doesn’t fill the entire void. Our team creates a solid, level foundation and pours concrete with a curing sealer so the apron will last for a very long time. 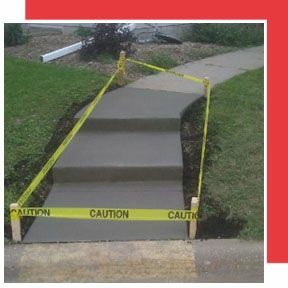 We can even level your sidewalk at the same time if you need it. If lifting and leveling concrete isn’t an option, we can remove your damaged concrete sections and replace them with new, level concrete. 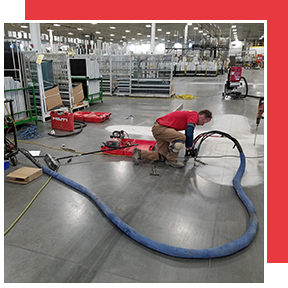 Our teams can replace everything from patios and sidewalks to warehouse floors and parking lots. Unleveled concrete isn’t just an eyesore—it’s also a walking and driving hazard. Even a quarter inch difference between one section of concrete and the next can cause trip hazards and injuries. Our team will help with this. We lift and level your concrete to make sidewalks, patios, pool decks, floors, etc. like new again. The low 2% moisture content of limestone sand results in a 95-99% compaction rating. 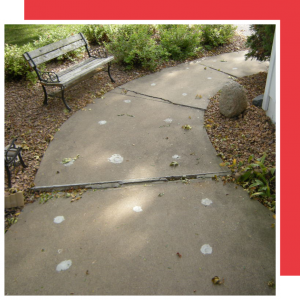 Concrete can be immediately walked on after our repair. 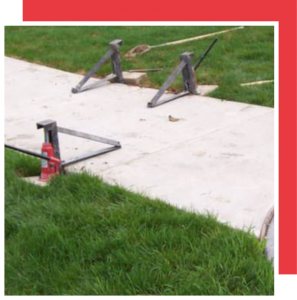 Ideal for concrete less than 10 feet in width that can be accessed from two opposite sides. 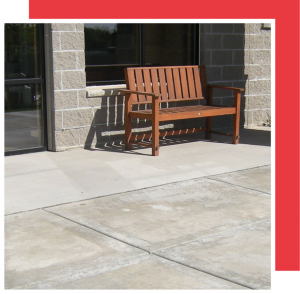 Once lifted and leveled to match the surrounding concrete, dry limestone is blown to fill the cavity beneath, providing a dry, consistent base with 95-99% compaction for the concrete to rest on. When we do not have access from opposite sides, or on larger concrete slabs, we use our patented pole jacks to lift and level. After filling with our dry limestone sand, the .5 inch diameter holes are filled to match surrounding concrete as closely as possible. We’ve seen it all, so our teams will be able to tell which sandjacking techniques are best for you. Polyurethane foam lifting uses polyurethane foam to raise and lift concrete to fill voids underneath concrete. The foam even clings to the bottom of the concrete for better structural integrity and insulation value. Like Sandjacking™, concrete that has been leveled with foam can be walked on or driven on right after our repair. It’s also more affordable than replacing the concrete altogether. We avoid drilling holes whenever possible, but if we need to, all holes are less than a half-inch wide. Polyurethane foam lifting is more environmentally friendly than people think. Our foams consist of over 40% renewable and recycled materials and won’t disintegrate into the soil. Polyurethane foam lifting also saves old concrete debris from piling up in landfills. Mudjacking, on the other hand, is an outdated way to level concrete. It’s not as effective in the long-term as Sandjacking or Polyurethane foam, so we don’t offer it. Mudjacking involves pressure point lifting which creates triangles or pads beneath the concrete, but it doesn’t fill the entire void. Moisture in the mud will evaporate which can cause resettling and cracking. Even Civil Engineers classify mudjacking as a temporary—not permanent—repair. Take a look at sandjacking, polyjacking and mudjacking compared. Over time, your driveway and foundation settle. 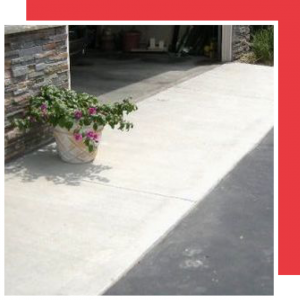 This creates holes and depressions in the area where your asphalt driveway meets your garage. Concrete garage aprons fix this problem. Our team creates a solid, level foundation and pours concrete with a curing sealer so the apron will last for a very long time. We can even level your sidewalk at the same time if you need it. Comparing bids? Don’t forget to ask about the warranty.